If I do not connect the motors (mean dim/brighten the lamps only), this code works very well. But when I connect the motors, everything mess up. Please, I really need help. I just don't know what to do again. Perhaps you could post some drawings of all the communication and power connections, otherwise we are all just guessing at the cause. I think there is no problem with my hardware since I have test it one by one previously. I mean I tested the dimmer and they works well, then I tested the motors and everything is fine. I think the problem is just in the code when I tried to integrate both of dimmer and motors. Anyway I attach the proteus file if you want to see it. The code doesn't know if your motors are connected or not, so why do you think it is the code? Have you actually built any hardware or does this just exist inside Proteus? I'm sorry, what do you mean? Previously I have succesfully control the motor as what I wanted. (motors only). The problem comes when I add the three lamps which are works well without motors. Yes I built the real hardware. It consists of three lamps and three stepper motors. So, any comments related to my problem? As Kartman points out, your software does not know if the motors are connected. So it must be your hardware. 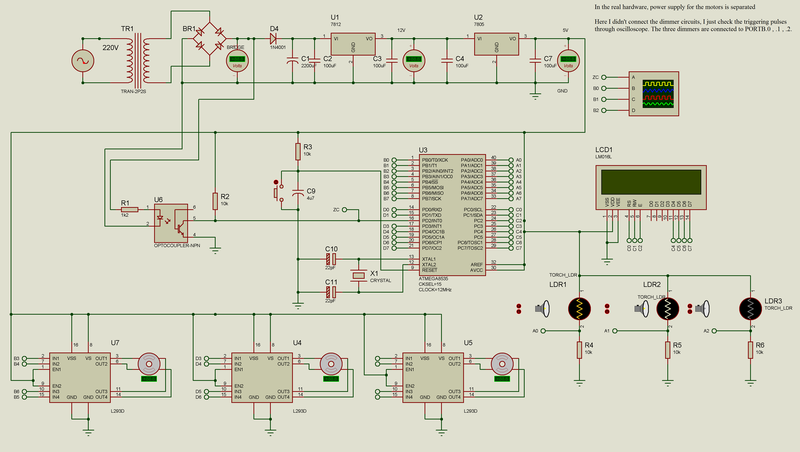 Please show us your schematic along with details of your power supply arrangements. PS, not all of us have Proteus so please post as PDF. I think we have a bit of a language issue here. In your first post you say you "connect" the motors then it mess up. Seems like when you combine the code, things don't work - but it works separately. Have you tried the simulator to see what happens? You might want to measure the execution time of your isrs to see how much cpu time is being consumed. Seems like when you combine the code, things don't work - but it works separately. ^Yes, That is exactly the problem. Have you tried the simulator to see what happens? Yes, I have. It is exactly the same as the real hardware. When the motors turn, all the triggering pulses are crazy. When energizing motor coils/inductive loads, switching diodes are usually placed in parallel with the motor to prevent the reactance from backfeeding into the source (shown on page 3 of the datasheet). Can you test to see if your code works while not actuating the motors at all? Have everything connected but don't give a motor a command. Furthermore, I see inputs directly coupled to the H Bridge. Try adding resistors in there, you would never really hook a low current sourcing output pin directly to a base. Put a series 1k resistor in place, maybe you are sourcing too much current out of your output pins and burning the controller up. Can you tell me the ohms of one motor coil? Lets say its 100 ohms. You have 6 of them, so the power supply needs to be able to hump out 5V/minohms. You need bypass caps on the motor chips and all the other chips that use vcc to eat the little blips in the vcc when stuff turns on and off. Disable the int0 interrupt and see if that is messing you up. You dont have pins assigned to motor 3 yet. Can't wait to help you with the lcd stuff. It is not a good idea to feed motors and mproc from the same point without any additional filtration. And I do not see Vcc pin in the picture. If the code fails in the simulator, then use the simulator to determine where it goes wrong! Short of replicating your setup, how can we diagnose the problem with such little information? I mentioned execution time - have you done any measurements? The atmelstudio simulator is good for such things.